The stylish and sleek 2015 Chrysler 200 is a whole new car from top to bottom, and you're going to love it! Come buy one from the people you know at Sulphur Springs Chrysler Dodge Jeep Ram; we've gotten hundreds of Greenville and Tyler, TX drivers into great Chrysler vehicles for years. 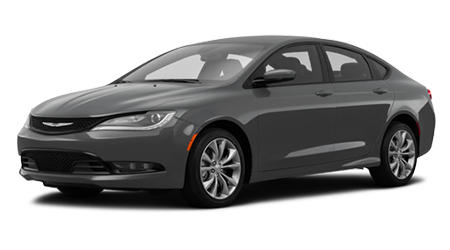 All-new for 2015, the Chrysler 200 is now one of the most stylish offerings in today's midsize sedan market. The lower 200 trim levels come with a peppy 2.4-liter four-cylinder rated at 184 horsepower. The top trim levels can choose an optional 3.6-liter V6 with 295 horsepower. No matter which engine options speaks to you loudest, you get a nine-speed automatic gearbox for smooth sailing anywhere you go. Cars with the V6 engine can also choose all-wheel drive, otherwise its front wheel drive across the board. All 2015 200 models get four-wheel anti-lock disc brakes, with traction and stability control for a safe journey. Trim level for the 2015 Chrysler 200 are LX, Limited, 200S, and 200C. The 200 LX comes nicely loaded with keyless entry, push-button ignition, power windows and locks, tilt/telescoping steering, and a four-speaker stereo with iPod integration, USB, and auxiliary jack inputs. The Limited adds 17" alloy rims and a six-speaker sound system. The 200 Limited has available Comfort (remote ignition, heated seats) and Convenience (rearview camera, satellite radio, 8-way power driver seat) package options. A sunroof and 18" alloy wheels are among the other standalone options available on this trim. The Chrysler 200S is the sports-inspired model. Standard features include 18" wheels, tighter sport-tuned suspension, special interior and exterior trim, cloth and leather-upholstered sport seats, and fog lights. The luxury-oriented 200C model gets everything but the sporty suspension and adds full leather upholstery and power adjustments for the front passenger's seat. Both 200S and 200C get the V6 powertrain standard. Option packages include Navigation and Sound (upgraded nine-speaker Alpine stereo and navigation) and SafetyTec (blind spot alert, adaptive cruise control; automatic wipers and high beams, and parking sensors). A premium package on the 200C adds real wood interior accents and heated steering wheel. All-wheel drive is also an option. If you're finding yourself bored by the lack of style in the other midsized cars out there, check out the sleek, all-new 2015 Chrysler 200. Sulphur Springs CDJR is always ready to assist drivers in the Greenville, Sulphur Springs, and Tyler, TX areas.